There is a reason why Obama promised to "fundamentally transform the United States of America. There is a reason why over the last two years, this government has been stockpiling ammunition and weapons. There is a reason why over the last two years we have seen local Police Departments around the nation add tanks, mraps and other assorted armaments. There is a reason why over the last two years that draconian laws like the NDAA, have been passed, effectively suspending the Bill of Rights. There is a reason why Congress continues to support and not impeach a President that brazenly breaks the laws and destroys the Constitution that he pledged to obey. There is a reason why for decades, but with greater and greater emphasis over the last few years, Obama and Congress have spent us past the breaking point and directly into an economic crisis that is so large, it is impossible to recover from. There are reasons for everything happening inside America and to America and more and more it is looking as if this is the year that we will find out, up close and personally, exactly what those reasons are. -W.E. When the stock market starts to behave like a roller coaster, that is a sign that a major move to the downside is right around the corner. As I have stated repeatedly, when the market is very calm it tends to go up. But when the waters start getting really choppy, that is a clear indication that stocks are about to plummet. 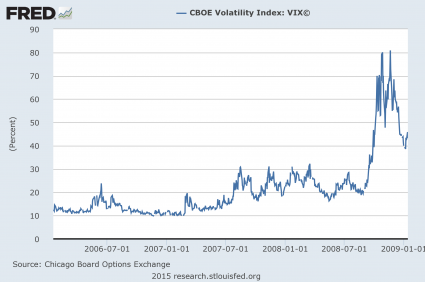 In early 2015, volatility has returned to Wall Street in a big way. At one point on Tuesday, the Dow was up more than 300 points. But then the bottom dropped out. From the peak on Tuesday, the Dow plunged nearly 700 points in less than 30 hours before recovering more than 100 points at the end of the day. The Dow has now experienced the longest losing streak that we have seen in 3 months, but that is not that big of a deal. Of much greater concern is the huge price swings that we have been seeing. Remember, the three largest single day stock market increases in history were right in the middle of the financial crisis of 2008. So if stocks go up 400 points tomorrow that is NOT a good sign. What we really need is a string of days when stocks move less than 100 points in either direction. If stocks keep making dramatic moves up and dramatic moves down, history tells us that it is only a matter of time before they collapse. Any student of stock market history knows that what we are witnessing right now is exactly how markets behave right before they crash. Looking back, it seems so obvious. So why aren’t more people alarmed this time around? Volatility has returned with a vengeance this January. The Dow has been moving up or down by at least 100 points nearly every day this year. CNNMoney’s Fear & Greed Index is showing signs of Extreme Fear again. And a volatility gauge known as the VIX, which is one of the components in our index, is up nearly 20% so far this year. Meanwhile, there are lots of other signs of trouble on the horizon as well. For example, the price of copper got absolutely hammered on Wednesday. As I write this, it has fallen more than 5 percent and it has not been this low in more than five years. In financial circles, it is referred to as “Dr. Copper” because it is such a valuable indicator regarding where the global economy is heading next. For example, in 2008 the price of copper was close to $4.00 before plummeting to below $1.50 by the end of that year as the global financial system fell apart. One growing global worry is the steep decline in copper, which is used in many products and is often viewed as good gauge on how China is doing. The price of copper hit its lowest price since 2009 on Wednesday at $2.46. Copper is down nearly 7% this week alone. Meanwhile, the recession (some call it a depression) in Europe continues to get even worse, and the euro continues to plunge. On Wednesday, the euro declined to the lowest level that we have seen in nine years, and Goldman Sachs is now saying that the euro and the U.S. dollar could be at parity by the end of next year. That is amazing considering the fact that it took $1.60 to get one euro back in July 2008. Personally, I am fully convinced that Goldman Sachs is right on this one. I believe that the euro is going to all-time lows that we have never seen before, and this is going to create massive problems for the eurozone. With all of these signs of trouble out there, the smart money is rapidly pulling their money out of stocks and putting it into government bonds. This usually happens when a crisis is looming. It is called a “flight to safety”, and it pushes government bond yields down. On Wednesday, the yield on 10 year U.S. Treasuries fell beneath the important 1.8 percent barrier. We will probably see it go even lower in the months ahead. Well, they may not want to rely on us too much, because there are plenty of signs that our economy is slowing down too. For example, we learned today that December retail sales were down 0.9% from a year ago, and this is being called “an unmitigated disaster“. Americans were supposed to be taking the money that they were saving on gasoline and spending it, but that apparently is not happening. Back on October 29th, I wrote an article entitled “From This Day Forward, We Will Watch How The Stock Market Performs Without The Fed’s Monetary Heroin“. In that article, I warned that the end of quantitative easing could have dire consequences for the financial system as bubbles created by the Fed began to burst. Indeed, the increase in volatility and its effect on prices across the capital market spectrum was closely tied to the Fed ending the third round of QE in October. We are moving into a time of great danger for Wall Street and for the global economy as a whole. If we continue to see a tremendous amount of volatility, history tells us that it is only a matter of time before the markets implode. Hopefully you will be ready when that happens.